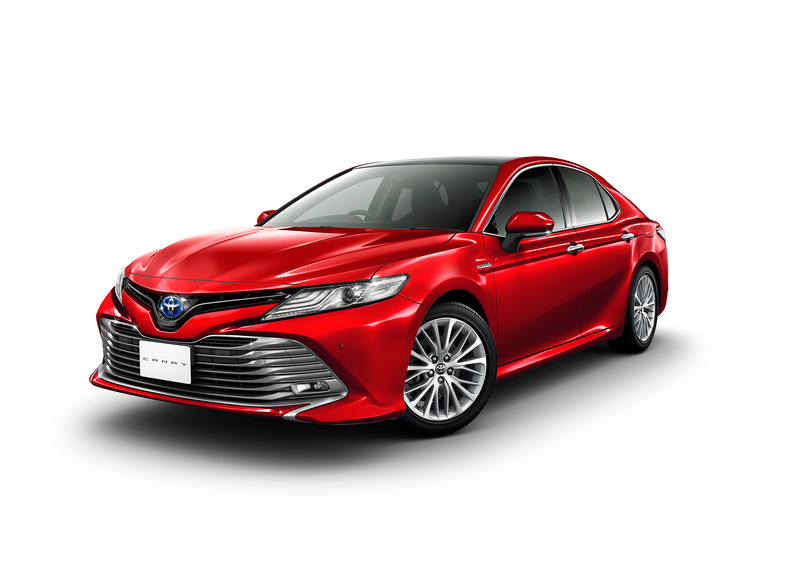 Toyota Motor Corporation announces the launch of its completely redesigned Camry in Japan and the start of sales at all nationwide Toyopet, Toyota Corolla and Netz dealers (including Tokyo Toyota dealerships). The original Camry debuted in 1980 as the rear-wheel drive Celica Camry. Initially sold exclusively in Japan, it was renamed Camry in 1982 and was redesigned as a front-wheel drive sedan for global markets. Since then, the Camry has evolved into Toyota’s global midsize sedan, sold in more than 100 countries worldwide. Cumulative sales have topped 18 million vehicles5, including unparalleled success in the United States, where it has been the best-selling passenger car for 15 consecutive years6. The new Camry design aims to test the limits of performance and intelligence, infusing the high-end sedan with a refined feel. The design team began with a blank slate, using Toyota New Global Architecture (TNGA) as the basis for the all-new platform, units, electronics, and other core components. The result is a striking emotional character, stunningly beautiful design, responsive driving, and premium ride performance. Augmenting these core features are a Human Machine Interface (HMI)7 to make driving easier, a high-class interior cabin with well-cut features, and state-of-the-art active safety systems. 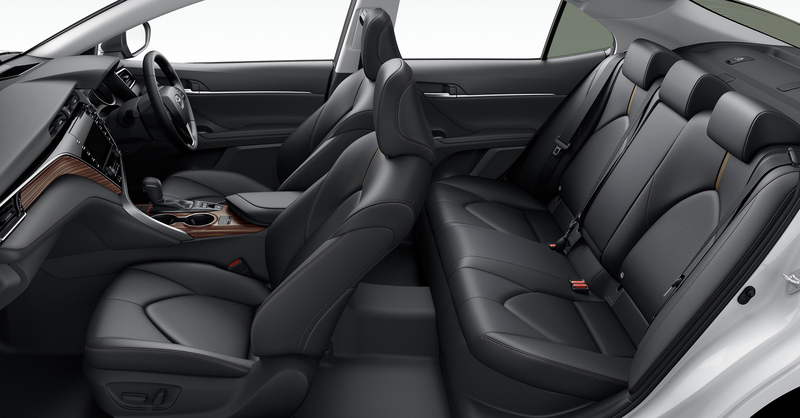 The new Camry redefines the standard for high-end midsize sedans. The TNGA-based design has lowered the engine and passenger layout to create a striking silhouette emphasizing a low center of gravity. 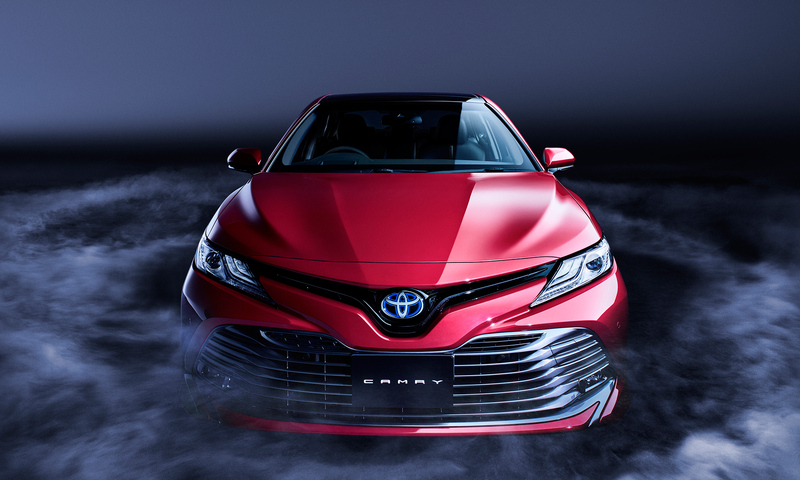 Toyota’s original Keen Look* design philosophy instills the Camry with a unique character, juxtaposing a slim upper grille with a bold, three-dimensional lower grille. The low center of gravity accentuates the overall wide stance. The Bi-Beam LED headlamps feature three-level stacked LED clearance lamps that provide high-quality visibility, offering a wide periphery and range of vision. The lowered hood and fender, along with low belt lines extending along the sides, accentuate the tires and low center of gravity. The rearward extension of the roof produces a more spacious interior and dynamic exterior proportions. Compact side windows lend the body a sporty, energetic feel. The rich intonations and sharp lines of the body combine to create glamourous molding. The wide stance produces a sporty look, while the raised shoulders lend a sense of stability and style. Striking LED lamps generate linear lighting, and the wide-set design evokes a sense of class. The instrument panel has a sleek look and feel driven by TNGA’s vision, incorporating compact parts and an innovative layout. The new package, achieved by the lowering of the engine hood, cowl, belt line, and other features enables increased expansive outward visibility and results in a sporty, spacious interior. The navigation display, color head-up display1, and multi-information display are integrated to present information in a way that optimizes the driver’s operational view and visual movements that allow the driver to focus on driving. 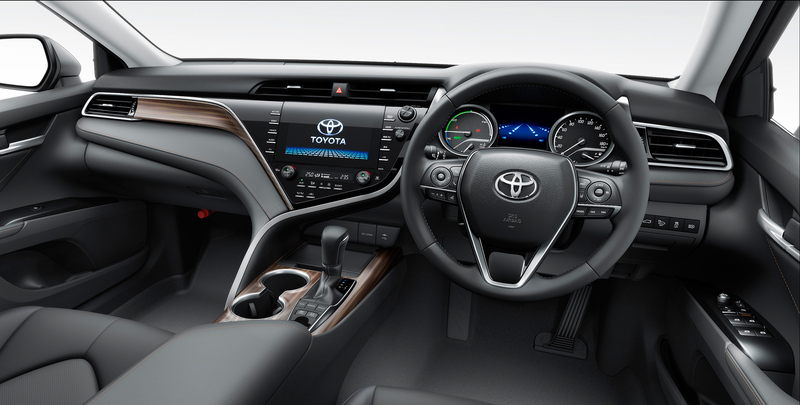 The center cluster panel, which controls the navigation and heater settings, adopts a flush-surface2 design. The adoption of cutting-edge interfaces creates a point of distinction. The metallic instruments are arranged in a seamless flow, while multiple colors and materials are coordinated perfectly to create a singular look and feel, including the use of a tiger-eye motif for the ornament panel. Altogether, the interior has a distinctive sense of quality attained through the fastidious attention to materials and rich feel. The responsive driving performance originates from the optimal weight balance offered by the newly designed TNGA-based platform and exceptional vehicle stability. Additionally, with its lower center of gravity, the Camry achieves exceptional stability and minimal sway during high-speed driving. All four of the engine mounts are hydraulic engine mounts (a first for Toyota), and the optimized placement of the mounts minimizes vibration and noise to ensure an exceptionally smooth ride. The suspension features newly developed MacPherson struts in front and double wishbone format in the rear, ensuring responsive driving and premium ride performance. The parallel rack electronically controlled power steering features responsive handling. The newly developed steering column enhances rigidity and improves steering ability. The body adopts a ring-shaped frame which limits torsional movement to ensure superior control stability. Body rigidity is further enhanced through the use of Laser Screw Welding, a state-of-the-art welding method for vehicle bodies, and structural body adhesives. The extensive use of ultra-high-tensile hot-stamp steel throughout the Camry reduces its weight while improving collision safety. The new Camry combines an all-new TNGA-based 2.5-liter Dynamic Force Engine, offering maximum thermal efficiency of 41% and high output, with the ever-improving hybrid system (THS II) to deliver fuel efficiency of 33.4 km/liter―top class among vehicles with similar engine displacement―and exceptional driving performance.